Arts lovers can enjoy a variety of talents on Saturday, Nov. 12, as Eastern Mennonite University hosts the annual gala concert at 7:00 p.m., followed by an open studio event in the Margaret Gehman Art Gallery, and finally a theater performance of “Far Away” in the MainStage Theater at 9 p.m.
Arts lovers can enjoy a variety of talents on Saturday, Nov. 12, as Eastern Mennonite University (EMU) hosts the annual gala concert at 7 p.m., followed by an open studio event in the Margaret Gehman Art Gallery, and finally a theater performance of “Far Away” in the MainStage Theater at 9 p.m. Professor Cyndi Gusler and Ashley Sauder Miller will host an open studio in the gallery between the concert and the theater performance. Visitors are welcome to stop by, watch the artists at work and ask questions. Gusler works in mixed media. Miller, a 2003 graduate and director of the Spitzer Art Center in Harrisonburg, is managing EMU Centennnial’s “10x10x100” Project. This summer, she won Best in Show and $7,500 for her mixed media piece “Faded Memory” at the Boardwalk Art Show in Virginia Beach. 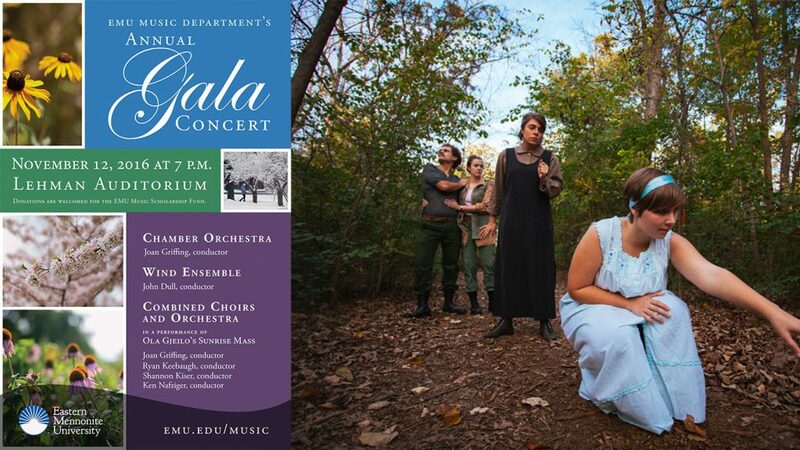 The Music Department’s annual Gala celebrating the winter holiday season showcases the breadth of musical talent on campus. The Wind Ensemble, under the direction of John Dull, will be performing Shenandoah by American composer, Frank Ticheli (b. 1958). The concert will be livestreamed. Visit emu.edu/live-video. The Chamber Orchestra, directed by Joan Griffing, will perform Ralph Vaughan Williams’ (1872-1958) English Folk Song Suite. The second half of the program will be a combined performance of Ola Gjeilo’s Sunrise Mass, commissioned in 2007 by the Majorstua and Nova Chamber Choirs. The work will feature members of the Women’s and Men’s choir, directed by Shannon Kiser; the Emulate Chamber Ensemble, directed by Ryan Keebaugh; the Chamber Singers, directed by Ken Nafziger; and the Chamber Orchestra . Suggested donations are $10 per person and will benefit the music scholarship fund. Written by absurdist playwright Caryl Churchill and directed by Professor Heidi Winters Vogel, Far Away centers around a young hat maker who faces her own complicity in a fictional world full of war and violent imprisonment. The play is appropriate for those middle-school-aged and older. By depicting “a culture where violence has become gradually acceptable,” the play gives the audience a lens to examine their roles and responsibility in the violence of our actual world, says Winters Vogel. She adds: “We need to talk about the little things that lead to the big things,” referencing the Syrian War, Black Lives Matter movement, and election-centered extremism as examples. A response session embedded in the end of the play will allow such discussion to happen within the theater atmosphere. The visual focal point for the set design is “The Horde,” a 1927 painting by Max Ernst that evokes World War I’s devastation of Europe. For the set, Anna Westfall, professor in the Visual and Communication Arts Department, has sculpted a giant burlap figure based on the painting – a symbol of the desperation and disconnectedness that is created by and fuels violence. Other performances are Nov. 11 and Nov. 17-19.